Just came across a free offer from Microsoft Press. It looks like they are trying to get out the word it seems. 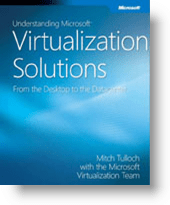 Today the App-V Team Blog announced Microsoft would be giving away a free copy of the eBook Understanding Microsoft Virtualization Solutions by Mitch Tulloch. sweet, printing this out and adding it to my “to-do” list.